JOHANNESBURG -- A wildlife photographer's candid shot of two male lions in what appears to be an amorous embrace at a reserve in Kenya has the African nation's moral authorities concerned about possible demonic possession, or humans "behaving badly" and setting the wrong example for the animal kingdom. "Demons also inhabit animals," Ezekiel Mutua, the chief executive of the Kenya Film Classification Board, told Nairobi News in an interview posted online last week. 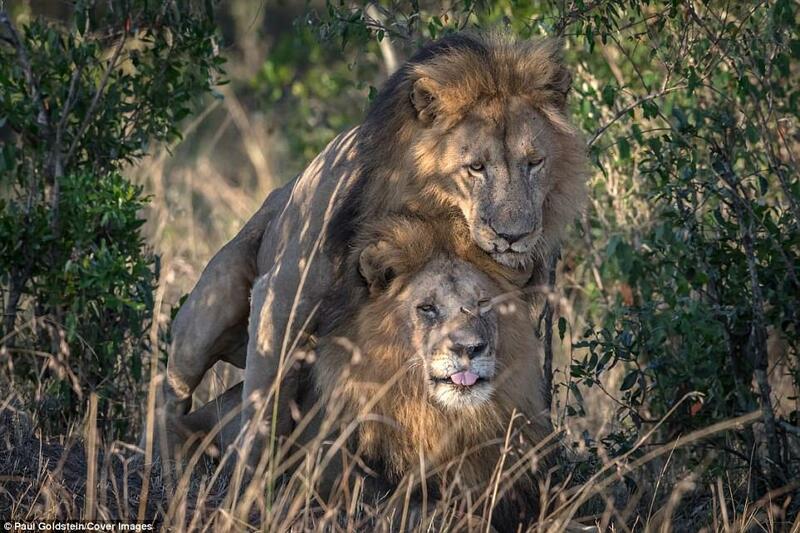 The recent photos, taken in a Kenyan wildlife area, do show a rare sight: a male lion mounting another male lion in what resembles a sexual act, but experts say may have been a way of showing dominance. The spectacle of two wild male lions in such intimacy was also observed in Botswana last year and has sometimes been interpreted as homosexual behavior, though lion experts say it is a relatively uncommon form of bonding or social interaction. Paul Goldstein, the photographer who captured the images in Kenya's Maasai Mara reserve in August, said many other species are known to engage in such behavior and that, for example, he had seen giraffes doing it. "It was just a dramatic thing to see," Goldstein said of the male lions. He was astonished by Mutua's remarks, declaring it "not normal" and attributing the behavior to demonic possession, or copying what he clearly believes is amoral human behavior. "These animals need counselling, because probably they have been influenced by gays who have gone to the national parks and behaved badly," said Mutua. "I don't know, they must have copied it somewhere or it is demonic. Because these animals do not watch movies." "The demonic spirits inflicting in humans seems to have now caught up with the animals," the film classification board director said. "That is why I will say isolate the crazy gay animals." Wild male lions have only mounted each other for a day or two in past cases that were observed, and the activity happens "during periods of social stress or a realignment of their dominance relationship," said Craig Packer, director of a lion research center at the University of Minnesota. "There have been several observations of male lions mounting each other without intromission, and the males subsequently resumed their normal patterns of mating with receptive females," Packer wrote in an email to The Associated Press. "Male lions form stable coalitions and they are very affectionate with each other, but this affection is expressed by rubbing their heads together, licking each other's faces and flopping on top of each other," he wrote. Another lion expert said cases of male lions mounting each other are "typically infrequent" and that he interprets it as a form of social bonding. "Male lions have to commit to supporting each other when a territory is challenged, so maybe at times of territory take-over males are stressed and more likely to" engage in such an act, said Paul Funston, senior director of lion and cheetah programs at the Panthera conservation group. In a blog post last year, Funston noted that a photographer documented similar behavior by two male lions that had traveled from Namibia to Botswana, and he described it as "remarkable but not unheard of behavior that was misunderstood by many." Ian Michler, maker of a documentary film called "Blood Lions," said lions "have been known to 'mate' as a way of showing dominance of other males" in a group, particularly a new one. While the lions photographed in Kenya and Botswana were confirmed to be male, Michler also remarked that some female lions with high testosterone levels grow manes, often don't produce offspring and might be mistaken for males.